You may have the seen last week that Rethink Robotics released the Sawyer robot, their latest smart, collaborative robot to join the Rethink family alongside the hugely successful Baxter robot. We’ve already had numerous emails and calls from people asking all about Sawyer, but other than the colour being the same as Baxter, how else do Sawyer and Baxter compare? Let’s take a look…. Firstly, Baxter and Sawyer are both ‘Rethink Red’ and this is the thing people are quick to point out first. They both adapt to real world variability in semi structured environments, are able to change applications quickly providing flexible automation to all users. 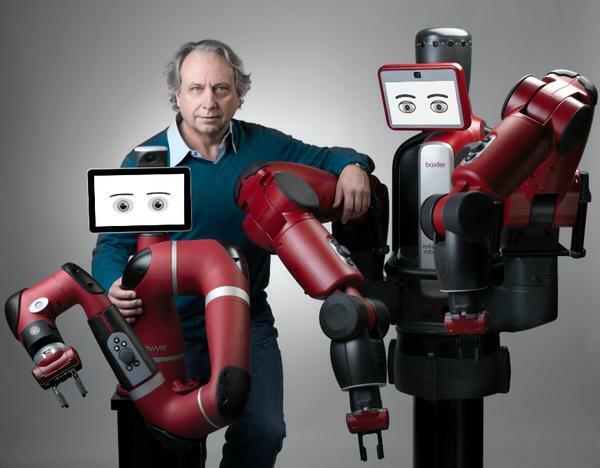 Both robots work like humans do to provide a collaborative human-robot working environment. Sawyer has been built to reflect the same low cost principles that Rodney Brooks envisioned for Baxter and will provide ROI typically within 12 months. Series Elastic Actuators are used in both robots to provide the inherent safety features that make Rethink Robotics Robots unique. Intera powers both Baxter and Sawyer meaning that what is learnt with Baxter can be applied and transferred to Sawyer. Neither robot requires caging as they fall within the safety parameters of ISO 10218, the International Standard for collaborative robots. Whereas Baxter is a humanoid robot with 2 arms with 7 degrees of freedom (DOF), a torso and a head, Sawyer only has one arm with 7 degrees of freedom (DOF) and no separate body. There is a higher payload of 4 kg with Sawyer as opposed to 2.2 kg with Baxter and Sawyer itself will weigh only 19 kg. Sawyer is more precise than Baxter and also has better repeatability, this is partly due to new zero backlash gear boxes and harmonic drive motors being used. Smaller and more compact than Baxter which makes Sawyer ideal for machine tending and line handling work as it can fit comfortably alongside human co-workers. Want to meet Baxter or Sawyer in person? We can come to you at a time to suit you and let our robots give you a personal presentation.